In a world where most of our clothes are punched from the same mega-factory mold, truly bespoke clothing is a privilege few of us get to enjoy. One Berlin-based fashion house, however, is bringing custom garments to the masses that are as unique as the sound of your own voice. 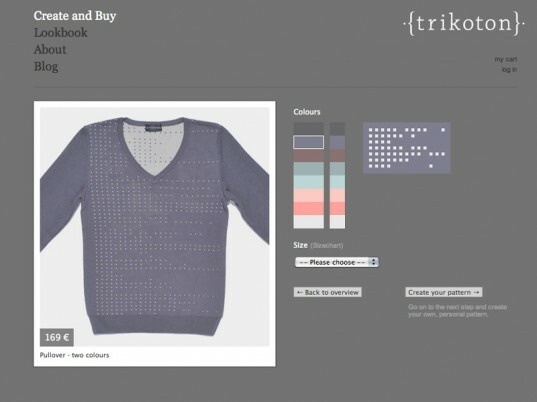 In fact, when you buy a sweater, scarf, legging, or vest from Trikoton, you can personalize it with your unique vocal pattern, thanks to a built-in web application that converts the frequency bands of an audio message into binary codes for knitting patterns. Preserving your voice for posterity is easy. Simply select the garment you want, then speak into your computer’s microphone when you’re prompted. Whether you’re reading a love letter to your sweetie, reciting your favorite poem, or just gabbing about yourself, your audio message gets woven into the very fabric of your clothing. The available designs come in an assortment of muted yet sumptuous colors. The coolest part? You can see the pattern being cranked out as you wax lyrical for 57 seconds. Using a web application, your audio message is recorded into the very fabric of your clothing. The interdisciplinary team behind Trikoton (“The Voice Knitter”) is interested in exploring new ways of making the garment manufacturing process more interactive, as well as more personal—and therefore less disposable—for the wearer. Fusing traditional and new technology, Trikoton works on an 1970s mechanical knitting machine that it upgraded with a few hacks. A microcontroller and 24 small engines, for instance, act as a pattern card that is directly controlled by live user input, which is processed through a connected PC. The possibilities for gift-giving and memento-making are limitless. Imagine recording a baby’s first coos, wisdom from a family elder, or the sweet nothings of a long-distance significant other. It’ll be like wearing a hug from someone you love, without appearing like a total sap.